It is a weekend again. It amazes me how time flies and how kind and thoughtful people on the blogosphere are. 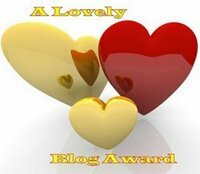 Like my new online friend Dee of Tales From The Mom Side who thought my blog worthy of the Lovely Blog Award. And of course, there's my sweet friend Enchie of Sweet Nothings who gave me the Friendship Chain and who just had a fabulous blog makeover. 1. Make your Authority Technorati explode. 2. Increase your Google Page Rank. 3. Get more traffic to your blog. 4. Make more new friends. 1. Start copy from “Begin Copy” until “End Copy” to your blog. 2. Put your own blog name and link. 3. Tag your friends as much as you can. 1.Picturing of Life 2. Juliana’s Site 3. Hazel-My Life, My Hope, My Future.4. Jeanne-The Callalily Space5.My Family is my Life 6. The Simple Life of a Baghag 7. On A Wonderful Day Like Today 8. House Everything 9. The Creativity in Me 10. Travel and Photography 11. Yesterday, Today and Tomorrow 12. You Are My Sunshine 13.Song to Remember 14. Super Blog 15. Philiippine Tv Marathon 16.Simply Blue 17. Breaking the Boundaries 18. Top Five 19. A Simple Life 20. Simple Happy Life 21. A Great Pleasure 22. Glossa~licious 23. Time Goes By 24. Sweet Nothings 25. Just About Anything 26. You're NEXT! Thanks Beth for compliment. Yup, ikaw ung BETH dito. hugs! Wow mommy kikamz mas maganda na site mo dito ang dali mag download, di tulad s Wp ang tagal. Anyways, thanks for stopping by at my site,atsalamat din for including me in your friendship badge here mwahhh! ill update ur URL soon, mukahang hindi pa ko masyadong nakapagrelax dito busy unpacking. Ill grab your button too later. give my smooches to babysam. Oh you already have this friendship chain na pala. i'm passing it on to you too, hehe! Generic [url=http://viagra.opuskali.ru]Viagra Super Active[/url] is made with thorough reverse engineering for the sildenafil citrate molecule - a totally different process of making sildenafil and its reaction. That is why it takes effect in 15 minutes compared to other drugs which take 30-40 minutes to take effect. Mommy Moments: Look At That Mess! Do Best and Lovely Go Together?